large valleys cut by glacier-fed rivers and streams." 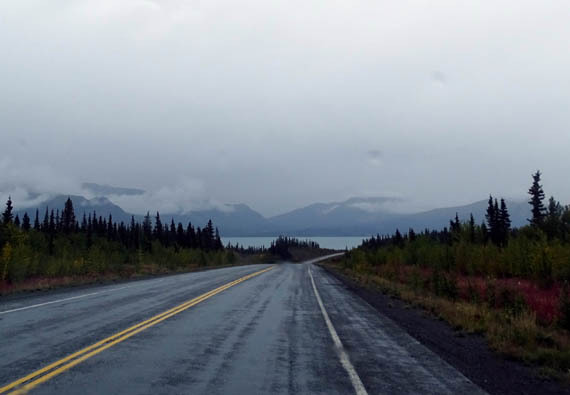 This is the fourth time we've driven past Kluane (clue-AWN-ee) Lake -- outbound in June and back in early September, 2012, then outbound this past June and back now in late August. I've just looked at my photos from our last three passages through this area of far western Yukon. Each time there were lots of clouds and even some rain but at least we could see the mountain ranges on both sides of the lake. and continuing with the bottom one to Whitehorse. 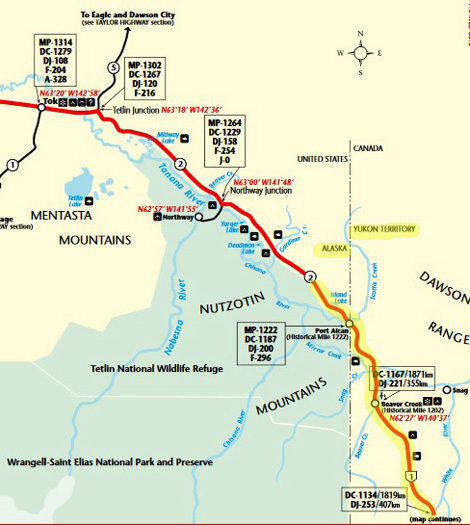 Maps are from The Milepost online. 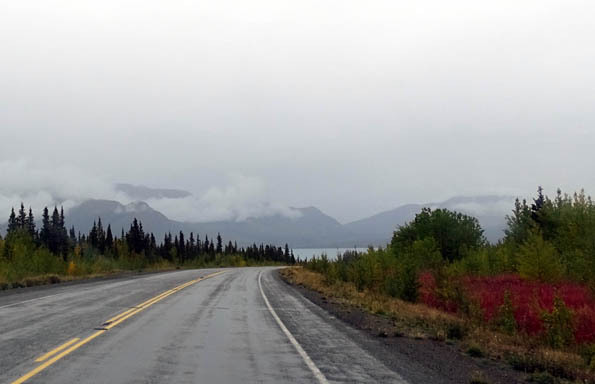 Today it was so foggy/rainy and the clouds were so low that we could barely see across large Kluane Lake, let alone see any of the higher mountain peaks in the region. 'Fraid I'll be whining about all the rain in this entry again. If you don't want to hear it, just scroll through the dreary pictures and hope that tomorrow's are prettier. It was cold (40s F.) and rainy all day, we couldn't see much of the beautiful mountains surrounding us, the road was positively awful from Beaver Creek to the north end of Kluane Lake, and we're both in a rather foul mood tonight, trying to decide how long to stay in Whitehorse and where to go next. 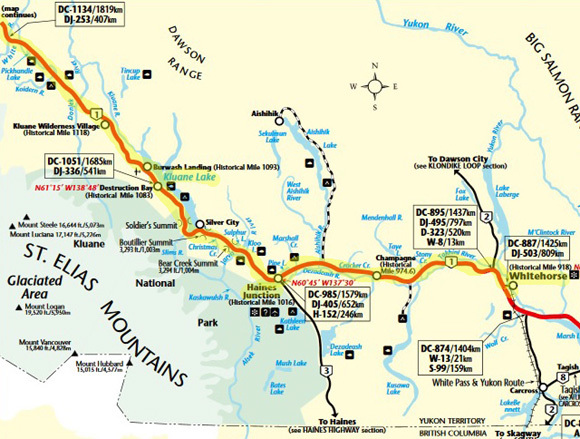 We had considered heading south on the Cassiar Highway through British Columbia tomorrow. We'll reach that junction before Watson Lake, YT tomorrow. However, the weather forecast for Stewart-Hyder and Banff-Jasper is crappy for the next ten days. If it was going to be nice soon we'd kill time in Whitehorse, where we have full hookups, WiFi, and cable TV for a reasonable price. 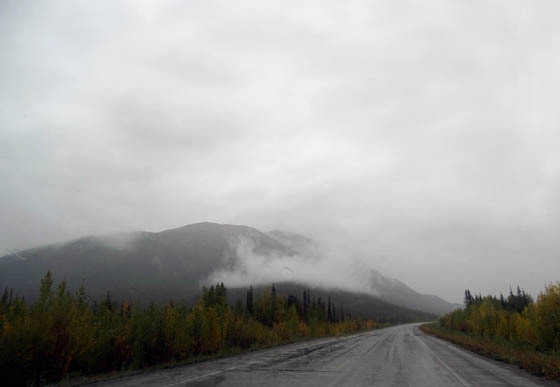 We've checked the weather predictions for major points east on the Alaska Hwy. and it looks like we can get into better weather this weekend by continuing on it instead of going south on the Cassiar. We want to be able to see more of the new scenery along the Cassiar than something like this. Dammit. 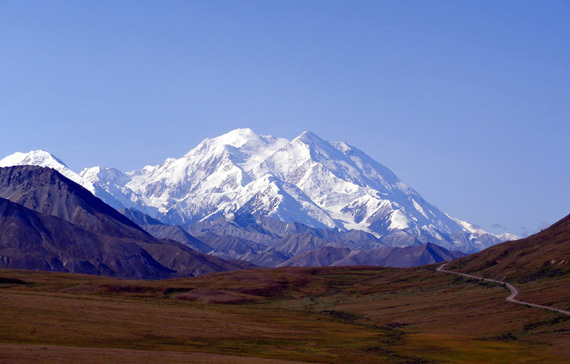 We've already missed some fantastic scenery while traveling during the past week and I'm still frustrated that we couldn't enjoy Denali any longer because of the rain. Now it isn't practical to check out a new section of British Columbia. Good thing we had better weather and better memories of this trip to the Far North until about a week ago. Meanwhile, it's in the 80s F. in Montana (that sounds good to us right now!) but thick, obnoxious smoke from wildfires is predicted in Great Falls, Billings, and other areas for the next week or more. Not sure how long we'll want to stay there, either, unless the prevailing wind changes direction. 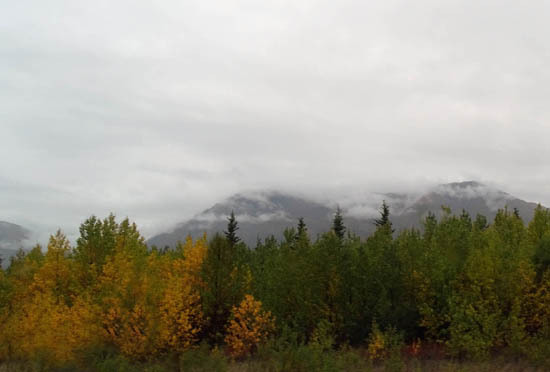 We left our pull-out at MP 1251 a bit west of the Canadian border in the rain just before 9 AM today and reached Pioneer RV Park in Whitehorse about 6 PM = nine hours of tedious driving in the rain. farther up ahead through this section -- all wisely headed south and east. 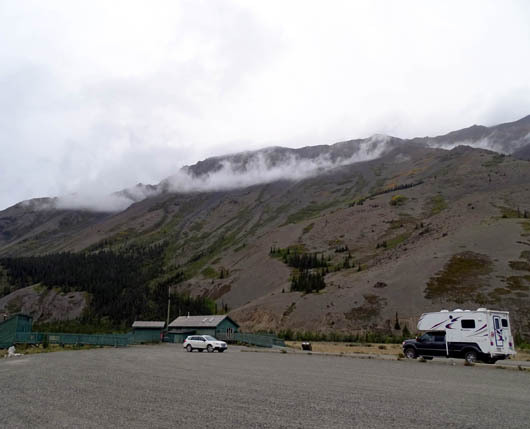 We stopped only three other times: 1) at a pull-off around noon to eat lunch, 2) at the Tachal Dahl visitor center (next photo below) at the southwestern end of Kluane Lake to take a break, and 3) at the FasGas station in Haines Jct. for fuel ($1.289/liter). Canadian total was $103.33. Our Visa charge was only $78.42 US. The exchange rate is very good for us right now -- 76 cents US to a dollar CA -- but quite lousy for Canadians. but we've never seen any in the three or four times we've stopped here. raw eggs or chicken? (glad we cooked them last night!). Nothing re: the produce we had left, vehicle registrations, proof of insurance, prescriptions drugs, or a dozen other things he could have asked. Thank you, sir! Hope the US border crossing is as easy as that in a few days. 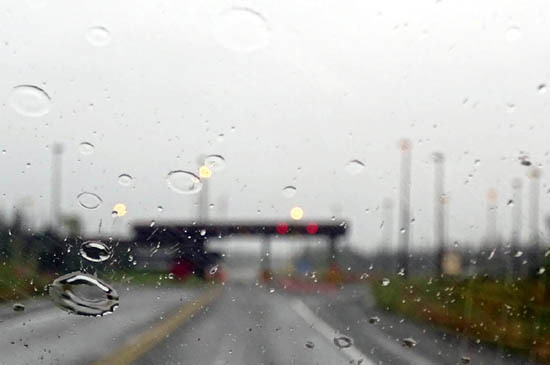 Rainy, blurry photo of the border crossing; they don't want people taking pictures of it anyway. We "lost" an hour when we crossed into the Yukon and we'll lose another one at the BC/AB border. Now we're in Pacific Time. There was minimal traffic all day until we got to Whitehorse at its afternoon "rush hour." With a population of only 25,000 people + summer visitors that's not so bad, especially since we didn't go downtown (with just the truck) until after supper. 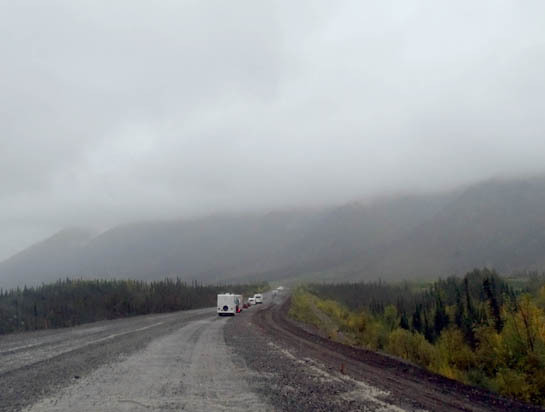 Our campground is located out on the Alaska Highway where traffic isn't as congested as the city streets. 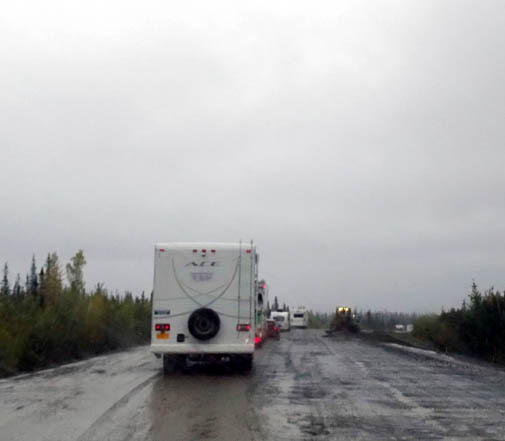 It seemed like we saw more RVs than semis or other vehicles today -- many going the other direction toward Alaska. What's with that?? Reverse snowbirds? Alaskans returning back home after vacationing in Canada and the Lower 48? It just seemed counter-intuitive to me. Elevations ranged from about 2,000 feet at Haines Jct. 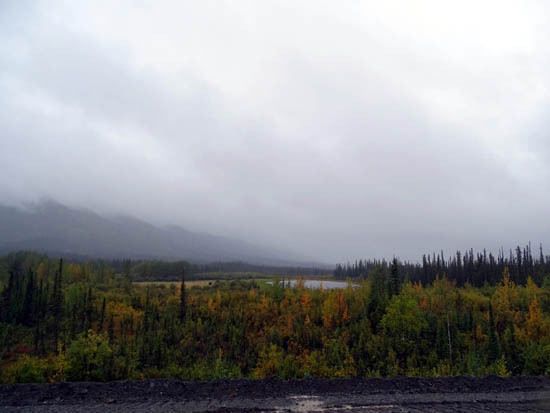 to over 3,500 feet north of Kluane Lake. We mostly traveled at 2400-2600 feet, where there was a good amount of leaf color. Although it was raining the whole time today I tried to get some photos of the nearby leaves and lakes that we could see. 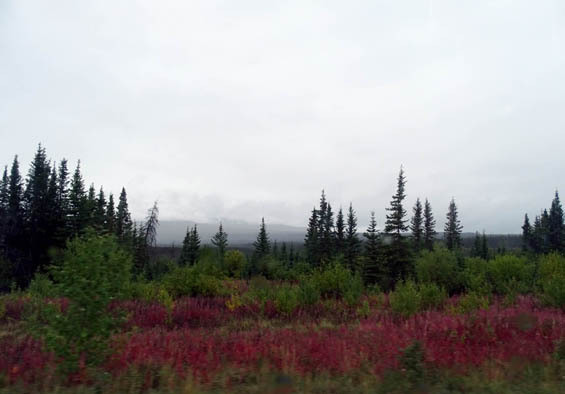 The red fireweed stems and leaves (two photos directly above) were the most colorful at the higher elevations. We saw no wildlife along the road today, yet another disappointment in such a remote area. This is the third time we've stayed at Pioneer RV Park in Whitehorse. We were surprised that it is as full as it is tonight but we were able to get a spot without a reservation. No one parked on our doorside, which would have been really close to us (sites are arranged so doors open to doors and utilities face utilities). We have full hookups, WiFi, and cable TV for $32+ CA with Good Sam discount. Our true cost is about 3/4 fewer dollars US, which is very good for a private campground. Jim went out to get fuel at Petro = $1.249/liter, less expensive in this larger town than earlier today in Haines Jct. Since it was raining and we've been to this RV park before, I didn't take any pictures of our site. 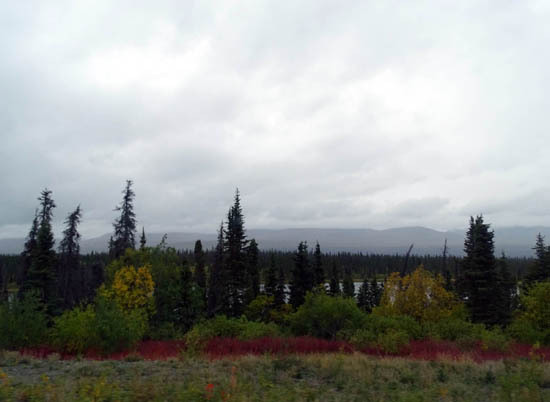 Here's another picture approaching Kluane Lake instead. Cody is as off-balance today as yesterday but he's eating well, sleeping well, and eliminating normally, with our help propping him up. We can see the confusion in his face re: being so disoriented -- what the heck is going on?? 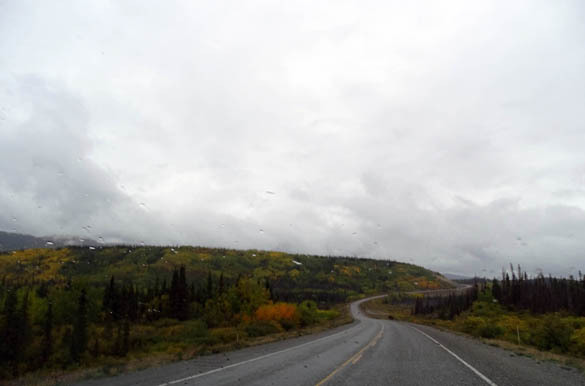 We hope tomorrow will be a better day as we continue east on the Alaska Hwy. I don't like being so negative. PLEASE LET THERE BE SOME SUNSHINE! !